California Conventions Blog: Ryan Reports Anime Expo 2016: Day 3 - Is it True?!? Waifu's That Fly You To The Moon! 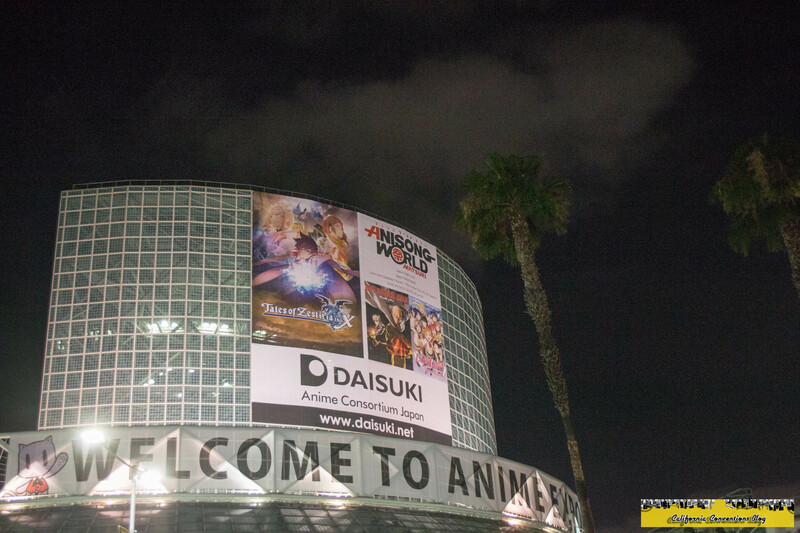 Ryan Reports Anime Expo 2016: Day 3 - Is it True?!? Waifu's That Fly You To The Moon! With not being able to interview FLOW yesterday and also barred from the their concerts today because of the invitational rule, I was about done with Anime Expo coverage for the year. As if it wasn't already appearant, the covention was already halfway over and Day 3 would be under way. Learning from yesterday's parking debacle, we would leave earlier today and get to the usual spot on Flower and Pico without hassle. Given the only thing left to cover would be the Cowboy Bebop Jazz Cat Expierence and Closing Ceremonies the next day and because I have been working myself ragged the last three days, I would have myself a "me day." I was going to do a few panels but decided I wanted to finally take the time out of my con to sell my collection of Weiss Schwarz cards that have been accumulating in my binder and Meister Sets to a dealer in the Exhibit Hall that I've dealt with before thanks to James. Before I did I received a tweet from Funimation's Peep Show MC Cookie saying because I tweeted throughout the show and didn't win a prize at the show I can now obtain one at the booth. I did just that and and won a pretty cool Funimation T-shirt some posters and otherwise lewd and special edition reversible DVD and Blu-ray slip covers for some of their titles. Jokingly, over the last year since I first started playing Weiss Schwarz and receiving my first deck, which was an SAO deck, I would continuously jest that I'd make a tournament winning "Asuna Waifu deck." Considering I've taken Weiss on a more compettetive level thanks to our local card shop picking up the game and holding tournaments plus placing in a convention tournament earlier this year, I asked the vendor with a chuckle if I were to sell enough cards so could such a deck be made. Without any hesitation, the vendor would seriously reply yes, followed by discussions on how disgusting Asuna can be on her own and price-wise this deck would not be for the faint of heart. I would have the vendor see if they found any cards worth while among my collection. Sadly not a whole lot turned up and I would go back home with my binder mostly full. Things were about to get a lot more interesting as I found out the cards the vendor pulled were worth bank! After some calculation my cards he selected came up to about $135 and some change and then mentioned if I really wanted the wife to be completed I had just enough credit to pull it off. They would go on to mention should I enhance the deck more but would have to drop close to another $50 on it. James had been wanting a "Leefa Waifu deck" as well but wanted to buy a box of SAO Vol. 1 since they were usually rare and out of print. We find out the set was recently reprinted and was on sale for $50 a box. I would ask James if he wanted to split a box with his money and my credit. Given how badly he wanted the Leefa deck done, he agreed and we got the box. As we divided the 20 packs down the middle, I would open my first pack and James' sodium levels rose as I pulled a signed Leefa on the first pack. What's so special about signed cards you ask? First, they are the hardest card to pull from any Weiss Schwarz set PERIOD! Out a whole box, you have a 1/120 shot of getting a signed card; however. with the odds of having the box contain a RRR, your odds drop significantly in the "box to crate ratio" and hoping of the ten booster boxes in one crate it has the signed card box in it. Trial decks have a better ratio at 1/6 but more on a realistic side of 1/4 having a RRR and 1/12 having a signed card in it. Leefa was worth double my initial investment I had made on splitting the box but the vendor would ask for a lower value. James, still upset, said he'd pay me for what the card was worth and I would sell the card to him; it was a signed card he really needed. Since I made a little more profit I would go on to build the deck now at a discount because we spent a lot of money at the vendor already. Not to mention I bought some packs for my friends and roomates back home as they were cheaper than our local shop. As the deck was being completed I got a call from the boss to get tickets for the Jazz Cat Expierence as tickets for press were available in the press lounge. As much as I wanted to browse the hall I knew what needed to be done. By the time I got up to the lounge, I found out they had ran of tickets meaning Day 4 would get duller on my end. I call Nate and ask if he had any luck with getting a ticket and he would go on to mention that he got the last one in the whole lounge. In all my days have I not had such irony and some what salt. I would laugh it up and Nate would ask to meet up later in the night to have a drink to a successful AX and play some Weiss with him. I agreed and told him I'd meet up with him after the second FLOW concert was over or CWF. Speaking of we had two hours until CWF was going down so James and I would go down to Kentia Hall and play Weiss with some convention attendees we met at the vendor who played Weiss to kill time. I win and lose a match while teaching on-lookers how to play the game and decided to pack up and leave with James to CWF. By the time we got there the line was already crowded to the small workshop and was then cut off. Thankfully with us knowing G we could get in but things get bad for james as the staff realized he didn't have a 18+ wristband and would eventually bar james from getting in even after he was told he could after onbtaining one. CWF is a very interesting concept. I would say that show isn't for everyone, that or if you don't attend the shows they do at other conventions you'd have a hard time following "the plotline." CWF stands for "Cosplay Wrestling Federation" and no they don't actually wrestle here. The show plays like an event where you have your face and heel characters act out wrestling promos for the crowd like an actual wrestling show, which is considered a match. The victor is chosen from the crowd in tournament style fashion and is decided who was champ at the end of the night until the next show which is Anime Los Angeles in 2017, although CWF runs a NXT-style "development league" at SacAnime Summer called "CWF Blackout." I enjoyed my time there aside the fact I practically got hit by one of the wrestlers props. James would take off upset because it was late and he got fed up with waiting for the event to end and went home with a friend. I got an email during CWF from the press department asking if we wanted to attend the last show at the Night Café featuring Japan's No. 1 pole dancer and GOH momoMC. Usually this isn't my cup of tea as I don't go to strip joints or events at cons such as Burlesque shows, but I figured for the sake of coverage and since I didn't wanna go home so early (10pm to me is still early by AX time) I would go and cover the event. I called Nate to see if he wanted to go but said he was at dinner to meet him after the show. I checked in with staff and got in, they would hand me a ticket that would get you a free drink at the bar, I took a double take and made sure I heard and read that right. I looked at the ticket and sure enough they weren't kidding, now of all the events I've attended in my years at AX this was classy and what I call customer service! I would grab my drink and take a seat up front as the show was about to begin. The show would begin with the MC and a Saucy intro of herself and how she got involved with the show. Mind you this was Ax's first Night Café but the story was convincing that you would forget that. After her introduction, she would open the first act of the nigh,t Snapper, she would come onto the stage in cosplay for Sailor Jupitor from Sailor Moon and well...dance to Blondies "Touch Myself" and do what Burlesque dancers do best....strip. A great performance demanded something more as the MC would start getting the crowd more interactive with the show by asking the crowd to things for more free drinks at their table. some saucy to the downright bizzare, then would introduce a game of truth or dare for the same concept. My tables representative did not win either but since I still had to drive home I didn't care. Following the truth or dare game was the main event with momoMC. She would come out it in a skin tight leather alternate variant of Neon Genesis Evangelion's Ayanami Rei. Before the performance we would be given special light sticks with a sticker of momoMC to cheer her on. BY GOLLY DAMN momoMC CAN DANCE!!! Theres a reason shes the No.1 seen and requested dancer in Japan!!! I assure nothing lewd happened during this performance but if you do watch our coverage of the show We WARN you its NSFW!!! My eyes could not believe the show they endured as surprisingly I had a good time and enjoyed the show and Café, I was also fortunate to get a photo with the girls of the café including momoMC. I would pick up the car and drive to the JW to meet Nate who was waiting in the lobby for me. We couldn't get the formentioned drink as it past last call so we chatted about how our conventions were and how the concerts was. It would be after 1am and we both needed to get ready to leave LA the next day so we said our goodbyes till SacAnime Summer and left. Since James went on ahead, it would be a lonely and tiring drive home alone. Once I was let in I went to bed and did not do another review. But something caught my eye on the way back to my car near Staples Center: a group of Love Live! (the original, not the recent Sunshine iteration) singing and dancing to "Snow Halation" complete with light sticks, cheering, and Love Live! merchandise/gear. Editor's Note: The top video was the original video Ryan shot while the bottom video is an improved version with overlaid official audio from the soundtracks.